Automotive-grade Ethernet cables, right, offer similar benefits in compatibility and bandwidth to conventional Ethernet cables. SAN FRANCISCO -- Cars and computers are converging, and the plugs prove it. Across the auto industry, a transition is underway to Ethernet, the networking system widely used to connect PCs to the Internet and one another. It is the best way, most automakers and suppliers have decided, to handle the huge amounts of data that next-generation driver-assist and infotainment systems will need to transmit and process. The most common system used in cars today, known as CAN, tops out at about 2 megabits per second. This is quick enough for some tasks but wildly insufficient if a car must process video from several sensors and cameras to drive autonomously down the highway. "The need to transport data inside the car is increasing rapidly," said Toni Versluijs, general manager of in-vehicle networking at Dutch supplier NXP Semiconductors, which claims a 50 percent market share for in-car networking. 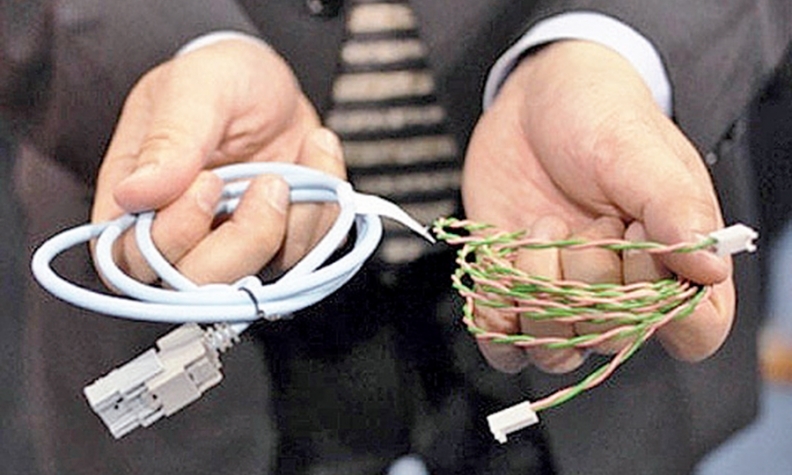 "Many of the OEMs are running out of bandwidth, and that's where Ethernet comes into play." BMW was the first automaker to employ automotive-grade Ethernet, which uses two twisted wires -- rather than the four or eight wires bundled together in an ordinary Ethernet cable -- to carry 100 megabits of data per second. The automaker's X5 SUV uses a setup from Broadcom Corp. for its surround-view camera. Both the Jaguar XJ and Volkswagen Passat now use Ethernet as well. And according to a report by Frost & Sullivan, the average car will have 50 or 60 Ethernet ports in 2020, while a luxury car may have more than 100. Unlike the USB ports in modern cars, the Ethernet ports will be tucked out of sight in wire harnesses. Drivers won't notice the switch. But suppliers will. Much of the Ethernet technology is being licensed from Broadcom, a Fortune 500 chipmaker that also leads a consortium setting standards for Ethernet in cars. "The car is becoming both a digital living room and a network," Ali Abaye, senior director of automotive at Broadcom, said in an interview. "So we see how two of our businesses could combine into the car." Broadcom's entry will put pressure on suppliers such as NXP, Texas Instruments and Renesas that sell today's networking technology, which goes by names such as LIN, MOST and FlexRay, in addition to CAN. Versluijs said that NXP has worked out an agreement to use Broadcom's technology, though he declined to share specifics. The technology suppliers see no reason to resist Ethernet. It has won strong support from automakers and Tier 1 suppliers because of its speed, low cost and use of an Internet networking protocol that's widely employed in other industries. Yet it may be a long time before CAN, with its long history of reliable service, disappears. Testing is still underway to see whether Ethernet is as reliable for safety-critical functions, such as engine and chassis control. "If you're a volume brand and you implement it," Versluijs said, "you'd better be sure that the traditional automotive requirements will be met."